The Israeli-made Dustar Dimona is a full tang all-purpose utility, field, combat knife conceived, designed, tested, perfected and manufactured entirely in Israel. The Dimona is manufactured to the most demanding standards like the 1 ARAD model. It's a classic combat knife design made from D2 steel; one of the toughest and best steels known in the knife industry. 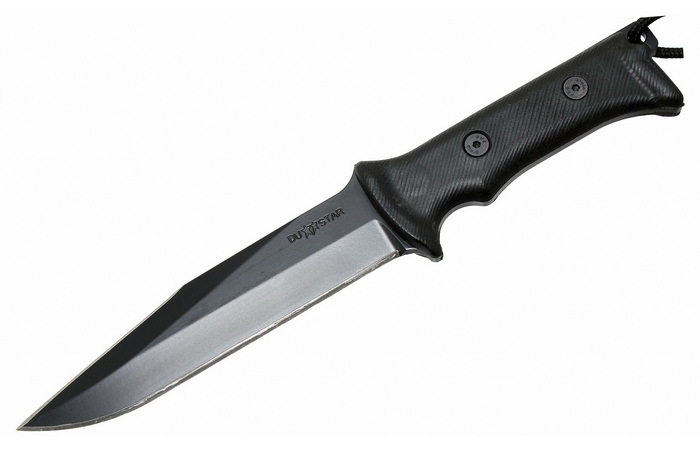 This version of the Dimona features a black clip point blade. The black Partinex handles are attached to the blade by four screws. The Dimona combat knife includes a black Cordura belt sheath with plastic insert.